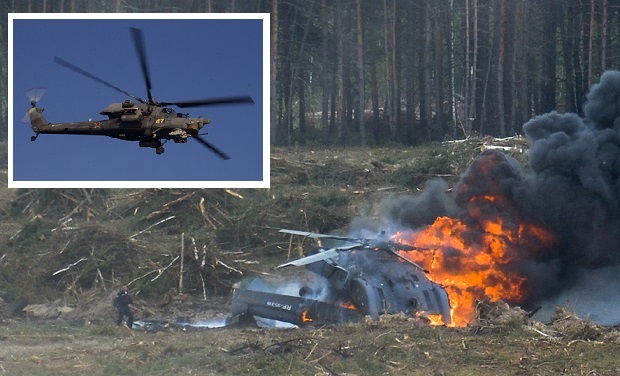 MOSCOW, Russia — At least four Russian servicemen were killed when a military helicopter crashed in the west of the country late Monday, the defense ministry said. “According to a search and rescue group that arrived on the scene of the emergency landing of an Mi-8 helicopter, three pilots and one technical instructor were killed,” the defense ministry told Russian news agencies. Contact with the crew was lost just after 1620 GMT, the defense ministry said, before the helicopter made an emergency landing outside the town of Ostrov, some 30 kilometers (18 miles) from Russia’s border with EU member Latvia. It remains unclear how many servicemen were onboard the helicopter, which was conducting a routine training flight according to the defense ministry. An unnamed source in Russia’s security apparatus told RIA Novosti state news agency that the helicopter had caught fire. Other sources told Russian news agencies the crash is thought to have been caused by a mechanical defect. The defense ministry said that military transportation experts were being flown out to the scene to investigate the cause of the crash.